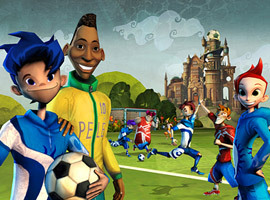 Our hero is a new student in the prestigious Brightfield Academy, a renowned football school for kids from around the world which teaches the true meaning of the sport to its students. Teamwork, Friendship and Respect are the key values that Headmaster Pelé shares. That said, competition at Brightfield is high, and the hero must form a team to stay in school and follow his goal to become a pro. Our hero's potential is obvious, and this has not been missed by the beady eyes of Von Trappe, the headmaster of rival Scythemore Academy, an institution that instils in its students the ideal of winning at all costs, even if this involves overt aggression or cheating. Von Trappe puts a plan into action to bring our talented hero to Scythemore, but Pelé learns of his trickery and ultimately outwits him, saving our hero from the hardship of spending more than one term at Von Trappe's brutal Academy. Safely back at Brightfield and with Headmaster Pelé and fellow student Mia Hamm's help, our hero is free to concentrate on winning the Academy Championships, graduating and earning a dream ticket into professional football.